Welcome back to Member Monday. Today we feature a unique submission by Writers Forum member, Linda Boyden. Writing pitches and press releases can sometimes be just as difficult as writing the story itself, so today Linda shares her pitch and the press releasefor her latest picture book, Roxy Reindeer, which was recently named among the Best in Family-Friendly Products by the Mom’s Choice Awards. Congratulations, Linda, and thanks for sharing your expertise. “Santa’s workshop is a busy place, especially on Christmas Eve. Everyone wants to help including Roxy, Santa’s youngest reindeer. Unfortunately, every time she tries to help, she seems to get in the way. Santa has no choice but to lead her to her stall so the elves can finish packing the sleigh. He tells her the problem is she’s too young and promises she can help next year. Will Roxy’s Christmas Eve be ruined? Not with Mrs. Claus around! Discover her plan that will turn Roxy’s frown upside down and make readers smile, too. 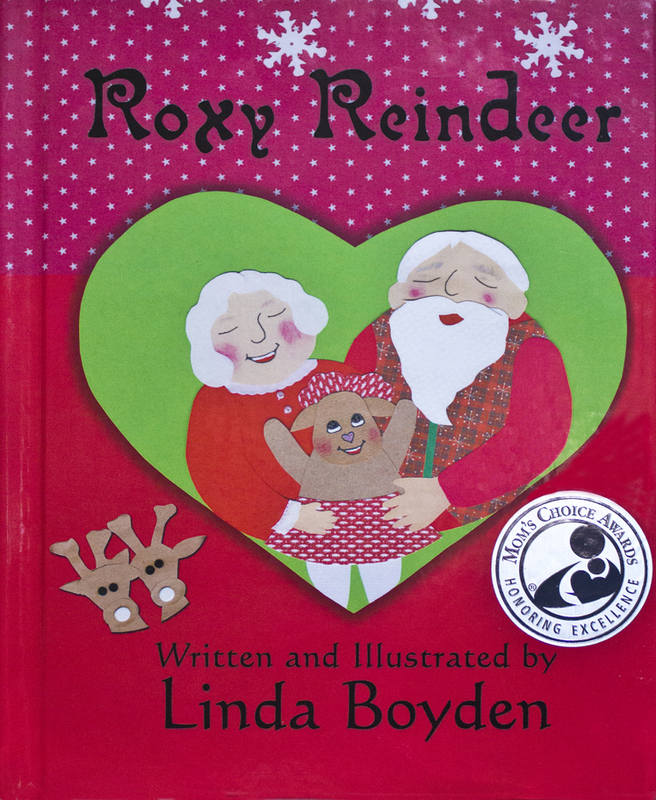 Summary: I am honored to announce that my fifth picture book, ROXY REINDEER, has earned the prestigious Mom’s Choice Award®. Having been rigorously evaluated by a panel of MCA evaluators, ROXY REINDEER is deemed to be among the best products / services for families. Redding, CA. The Mom’s Choice Awards® has named ROXY REINDEER as among the best in family-friendly media, products and services. The MCA evaluation process uses a propriety methodology in which entries are scored on a number of elements including production quality, design, educational value, entertainment value, originality, appeal, and cost. “I am thrilled to earn the Mom’s Choice Awards Honoring Excellence Seal of Approval,” says local author/illustrator, Linda Boyden. “I know all the great things the MCA does to connect consumers, educators, and caregivers with the best products and services available for families. With the evaluation now complete, the testing samples of ROXY REINDEER will be donated to schools, libraries, hospitals and nonprofit organizations. Learn more about the Mom’s Choice Awards by visiting their website: http://www.MomsChoiceAwards.com. Welcome back to Member Monday. Today we feature a piece by Writers Forum member, Linda Boyden. You can catch Linda and a host of other local authors at the Authors Fair at the mall on Saturday, November 14th. Welcome, Linda. A brief synopsis: Fourteen-year-old Twitch Taylor hasn’t paid much attention to the old Cherokee stories. Sure his family is Cherokee, but the stories are just the elders talking, right? After a freak car accident kills his aunt, Twitch’s father gives him away to his brother according to an old Cherokee tradition then disappears himself. Overnight Twitch has gone from being a city kid to a country bumpkin. He argues how in the 21st century no one follows this old custom. Uncle stays stubborn and Twitch ends up stuck in a forest learning how to hunt with a bow and arrow and identifying types of plants. He quickly discovers this ancient forest is far from normal. Many of the Cherokee myths are coming alive, including one tied to his aunt’s death and his father’s disappearance. To combat these, Twitch must learn to be a Stone Keeper like his father and grandfather before him. The trick is can he learn fast enough to save himself, his family, and pretty much the rest of the world? Is he man enough? “The tsi’sdu, rabbit, boings away like its legs are made of rubber. I run, feet on fire, and stay with it till it zooms up a ridge. “Son-of-a-gun!” I holler. I kick a hollow log and two chipmunks roll out, cussing me in chipmunk-speak. I cuss them back and crane my neck, but see nothing. Trust a tsi’sdu? Yeah, right, that girl or woman or whoever she was, surely doesn’t know a thing. Crazy drumming or not, I’m going stick to my plan to hitchhike back home to Marquis, but then don’t I spot it? Yonder up the ridge, its pale body waits in front of something dark. From down here, seems like a black smudge on the mountainside. Welcome back to Member Monday! We hope you got to see the spectacular lunar eclipse last night. It’s a pleasure to serve up a second helping of lunar wonder by poet, storyteller and children’s author, Linda Boyden. You can purchase a hardback copy of Linda’s newest picture book Boy and Poi Poi Puppy at All About Books. Welcome, Linda! I lie in night’s velvet deep. the night softened by their song. The full moon bleeds the landscape white. the only sound, my metered breath. its body, a crucifix of shadow. I fall on my knees, heart pierced by beauty. he needed, but he couldn’t find the words. there was no need for words.